Its been too long since my last newsletter! Now its already Autumn and I have not updated you with Summer news! I had a great Xmas break. 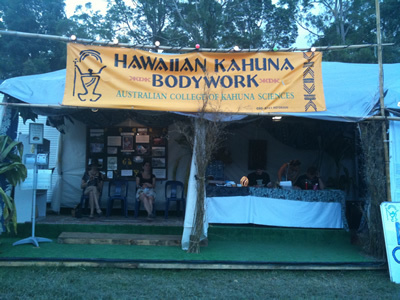 I did some more Kahuna Bodywork training at Woodford Music festival in QLD. This is a massive world music festival similar to Womad, only about 10 times bigger! The Australian College of Kahuna Sciences has a stall there each year where students participate and work on the festival goers. Its a super chance to update skills, learn more about the bodywork and connect with other students and my teacher Ki’a’i Ho’okahi Weber. I was there for eight days working in the therapy room doing bodywork and also helping my teacher manage the logistics of running such large stall. 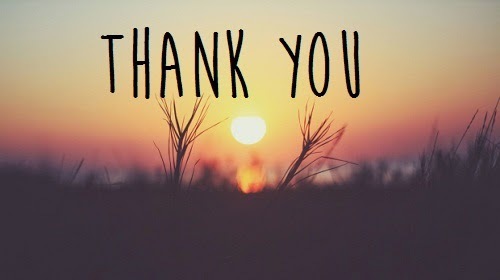 It was a really super week and in total I worked on about forty different people while there. When in such an intense environment, which requires huge demand physically, emotionally and mentally, the range of our skills increases and we scale to new heights in our capabilities. Working on one person after another, day in day out, allows deep integration of new levels of awareness and anchors in new, more contributing holding patterns and ways of being for us. Great change occurs internally for both the bodyworker and the client, and it is a time to savor and appreciate, as its only an opportunity for training that comes once a year. 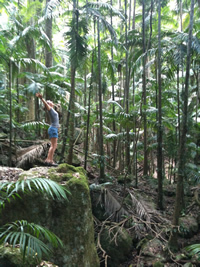 I continued my training down in NSW for another 10 days and participated in a kahuna training workshop. This is a different style of training to the festival, and although very physically demanding, is a great way for me to begin my year. We do a lot of exercises that promote the movement of chi or energy throughout our bodies. This gives me a perfect beginning of the year as I have a chance to repattern my own energy in my body, and set myself up for a new year. 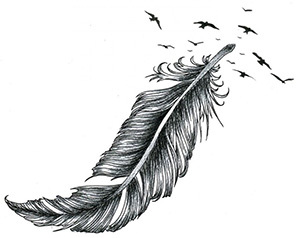 Its a super way to let go of old things, whether that is an outdated belief system, or a way I might be walking or standing that is not good for my being. The training effects us on all levels, physically, mentally, emotionally and spiritually – its a bit like clearing out the old clothes closet on all levels, and starting fresh for the year.It was a great way to begin my year!